As the twinning relationship deepens between Cork and Coventry, so does the poetry. 2010 produced yet another eventful exchange with poets Barry Patterson and Anthony Owen performing at Ó Bhéal and the Whitehouse in Limerick last July, followed by a memorable reciprocal visit by four Cork poets for the Coventry Peace Festival. For the complete review written in six seperate voices with photos, click here. 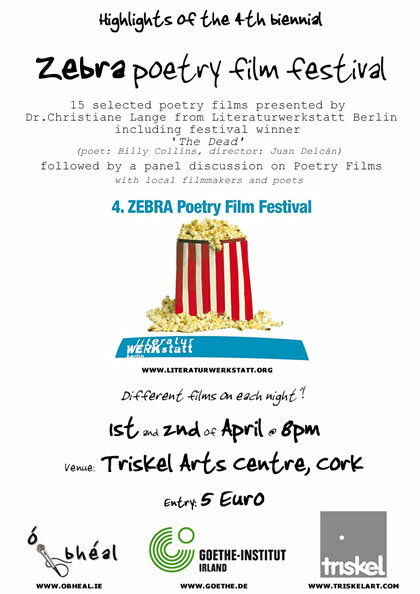 The 5th International Zebra Poetry Film Festival, held biennially in Berlin, is to screen the Irish poetry-film, The Lammas Hireling in October. It is the largest and most significant festival of its kind, so the email was particularly sweet. The Lammas Hireling from Paul Casey on Vimeo. From a choice of about 1000 entries the programme commission has selected your film to be part of the film programme of the 5th ZEBRA Poetry Film Festival. We would therefore be happy to welcome you to the festival from 14th – 17th October 2010 here in Berlin. And so goes the email of the year. On a zero budget, creating the film version of Ian Duhig’s award winning poem The Lammas Hireling, adapted for the screen with poet Sam Thomas, took the best part of eight months of near full-time beg, borrow and pray tactics, in order to be realised. Made by Paul Casey with the help of poets from Ó Bhéal, the ten minute film has a primary cast of two Corkonians, Geoff Daykin and Rosie O’Regan, who play the Farmer and the Hireling/Departed Wife, as well as a small flock of Cork poets who volunteered their natural skills at being extras. Most of the work and many of the locations and props were kindly donated by a long list of supporters from Cork and Antrim. The score reinterprets McCauley’s ‘The Aul Lammas Fair’ exquisitely rendered by Santiago Philharmonic Orchestra violinista Macarena Ferrer, and score engineer Carl Hammond. The film was shot mostly in various parts of County Cork while the framing scenery was captured on the Northern coast of Ireland, around the Glens of Antrim and Ballycastle (plus a day on Rathlin island). Ireland’s nearest point to the Scottish Mull of Kintyre features in some of the time lapse sequences in the film, which was made entirely from still images taken with a Nikon D90. Completed in June 2010, The Lammas Hireling has been entered into at least a dozen other film festivals and has also been accepted for two literature festivals. This post will be updated with screening info as it becomes available. Do I sense the rise of the poetry-film? Hopefully this new fusion of art forms will catch on more. It really is an avant-garde dance of 21st century digital technology with the timeless steps of poetry, which must surely be the freshest and most innovative combination of creative forces that can be experienced today. Whilst not quite the same as learning another poet’s poem off by heart, it’s a deeply rewarding experience, as is the festival in Berlin, showing the best from across the globe. See you there! Terry McDonagh is certainly inspired enough to keep this festival on its toes, and what better tribute to pay than to Mayo’s most renowned poet, Anthony Raftery, who left Kiltimagh in the late 18th Century after breaking the back of his master’s horse. He spent the rest of his days wandering half-blind and reciting his poetry in the towns and along the roads of County Galway, where he now lies buried in the ‘Cemetery of the Poets’ (Reilig na Bhfilí) in Killeeneen (Craughwell). After a four days of outreach workshops in local schools, book launches and readings by Colette Nic Aodha, Louise Lawrence, Geraldine Mitchell and Terry McDonagh, the Friday night readings by Phillip Casey and myself, which drew an excellent crowd of discerning enthusiasts and then the impromptu readings and song at Kitty McGreal’s and workshops on rhythm and music in poetry the next morning, the festival ended with the usual Saturday night Festival Slam, which saw two rounds of readings end with five finalists. Defending champion Micéal Kearney relinquished his title to newcomer Elizabeth Mace. 2nd place went to Tony Reidy, 3rd place was a tie between John Walsh and Miceál Kearney and 5th went to Una Flanagan. Well done to the contestants, and thanks to Terry and the Raftery Committee for keeping this important festival vibrant and fresh year after year. On the way back to Cork I decided to stop in to Reilig na Bhfilí to pay my respects to the man himself. The videos and review are here. It marked another magical excursion into the west Kerry gaeltacht as ten poets from Ó Bhéal and as many from Limerick and Tralee descended on Ballyferriter’s little poetry festival. 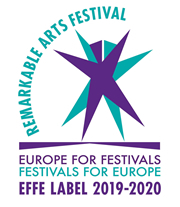 Due to rapid expansion and popularity since it began a few years ago, the festival committee are now calling for a new name for this annual event. This year featured workshops and a reading by Waterville-based Paddy Bushe as well as a lecture on local history by Dr. Deirdre Nic Mhathúna. After settling into the local cuisine on Saturday evening, we were welcomed by Máirín Feirtéar (the last living descendant of Piaras Feirtéar) and Domhnall MacSithigh, in the theatre at Tigh ui Chatháin. After a short reading by Paddy Bushe, Máirín and Domhnall then chaired the yearly open-mic, which is for me the festival highlight, giving stage to a variety of quality poets, chiefly from across Munster. As per last year, the next morning we found ourselves once again comfortably gathered in Dingle, packed into Diseart chapel and bathing under the magnificent stained-glass windows of Harry Clarke. Firstly we were treated to an excerpt and dramatisation from Noel Ó Briain’s translation of Cúirt an Méan-Oíche (The Midnight Court), played out by Noel and Áine Moynihan. This was followed by readings from all the poets present from Limerick’s Whitehouse, Cork’s Ó Bhéal, Tralee’s Doghouse and local poets, chaired by Bríd Ní Mhórain, Billy Ramsell and Bertha McCullagh. The festival closed over a well-deserved breakfast at the Garden Café where much talk was given to next year’s return to Ballyferriter. A big thanks is due to the Féile Bheag Filíochta committee for organising this event, which holds a uniquely special place on Munster’s annual poetry landscape. Make it next year if you can! Ó Bhéal’s Jazz-Poetry night was all a-buzz yet again this year with the BACKRA MeN, over from Coventry with Jon Morley on poetry, Si Hayden on bass and Ben Haines on drums. For most at the event this made a relaxed and excellent end to the festival. The band even took on Romanian guest poet Denisa Mirena Pi?cu’s poetry from her brand new hot off the press collection, Disposable People. For videos from the night click here. 18 poets from across Munster competed in two rounds last night at Ó Bhéal to produce this year’s Munster Slam Champ, Tobias Manderson-Galvin, and runner-up, Tom McCarthy. Congratulations to both, who will represent Munster in the 2009 All-Ireland Slam Championships held this year in Galway on the 26th of October. North Beach Nights will be hosting the event, which alternates annually between the four provinces. Congratulations to all the contestants who were all on top form, Rosalyn Blue, Donna Coogan, John Carmody, Ed O’Dwyer, Marie Coveney, Paddy Doyle, Seamus Harrington, Tobias Manderson-Galvin, Lorcan Murray, Mary O’Connell, Ciaran O’Driscoll, Jonni O’Gorman, Rosie O’Regan, Stephen O’Riordan, Christy Parker, Tom McCarthy, Colm Scully and Patricia Walsh. Videos of all the performances are this way. This year’s Cork-Coventry twin-cities poetry exchange turned out to be far more exciting and fruitful than any of the participants had imagined … from Coventry, Kenilworth and Stratford to Cork, Kinsale, Allihies, Waterville, Dublin and Belfast. For the complete review written in eight seperate voices with photos, mp3s and poetry, click here. For poets and filmmakers alike, these were two events not to be missed. Zebra is a high-profile event held in Berlin, combining the two art forms of poetry and film in every way imaginable. We first made the link with Berlin when Pat Cotter from the Munster Literature Centre initiated a four-poet expedition to Zebra in October 2008. After introductions and five days of poetry-films, the organisers agreed to showcase the festival in two Cork events organised by Ó Bhéal, which were then made possible with help from the Goethe Institute and the Triskel Arts Centre. The events here sparked much debate about how to realise poetry films, which are budget-flexible artworks that can be made very simply or with much complexity. They can be thirty seconds long or thirty minutes. Recent poetry films seem to be weighted on the side of visual effect and we have started working on a few local projects that will give more weight to the poetry end, with perhaps more innovative and simple camerawork. Animation overlaying is a lot easier now with the range of software out there, and we don’t have to create Matrix-level images to make a good poetry film. The Zebra festival attracts entries from many parts of the world, and there tends to be a lot of integrated animation. Although Ireland has not quite yet advanced in the field of animation, as poets we now have a whole generation of young film-makers to collaborate with, and they in turn have inherited a wealth of fine local poets to choose from (as well as worldwide). Films can be made of classic pieces or poems can be written for a film concept. The combinations of possibilities offered by these two art forms seem inexhaustible. From over 700 entries about 140 made it to the festival screen, so filmmakers can benefit from this exposure and double their submissions into short film festivals. Details of the Zebra Poetry Film Festival can be found on the Literaturewerkstatt website, here. Anthony Raftery would be in his element if he knew what Terry McDonagh was up to in Kiltimagh. He’d go home altogether, I’d say. The festival took a step up this year with world-class guest poets Nuala Ní Dhomhnaill and Matthew Sweeney (who was also poet-in-residence). In the Town Hall on the Friday evening, Nuala read from her recent collection, Fifty Minute Mermaid (translated by Paul Muldoon) and there was music by Diarmaid Moynihan, Margaret O’ Riordan, Mary McNicholas and Ollie Burke. After that the crowd split up to fill two local pubs, Lil Fordes and Kitty McGreal’s for a more informal, impromtu night of poetry and music from all. The Festival moved comfortably along with the guidance of Arts Officer Ciarán Friel, and Saturday began with Creative Writing workshops. Later on in the evening we heard readings by Matthew Sweeney from his latest bi-lingual collection, Het ijshotel and also from Ger Reidy and Andrew Forster, with music by Tony Reidy. After all that, the (by now large) crowd headed off to The Park Hotel for the festival Slam, which was hosted by Mags Treanor and won by Slam-Maestro, Miceál Kearney. On Sunday at the Old Schoolhouse there was a quiter gathering for a relaxed ‘open-mic’ session which ended the Festival on a gentler note. Thanks to Terry MacDonagh and his hosting talents, Co. Mayo is firmly on the poetry map. I’ll be there again next year. Videos of the Saturday Slam and poems read on the Sunday are this way.